I have been watching, but not participating in (yet, see below) Bruce Heard's World of Calidar Kickstarter. I will be honest, it looks fantastic and it should be a lot of fun. But I was going to wait for the PDF since I never feared that he would get to his goals. Plus I am trying to cut back on my Kickstarter addiction. Bruce is a great guy and I have been a fan of his work since the Glantri Gazetteer first came out. So I know this is going to be a good one. Thorfinn Tait is doing the maps. If you don't know Thorf, well he has been doing maps for Mystara's fan community for decades; going all the way back to the MYSTARA-L list on MPGN.net. I changed my mind this past weekend. I was going through a stack of old notes and sheets for a different project that I found my old Spelljammer characters. I say Spelljammer, but we never quite got that far. The idea was loosly based on Star Trek and they characters all started on ship that would eventually get to the stars. All the characters were officers so even the 1st level wizard began as a 3rd level fighter. It was going to be something very, very different than what I had done in the past. But the realities of college life got in the way and we never got all that far with it. I have no idea if my DM at the time even did anything else with it. I think he did. The game was going to be predominantly on the shared Mystoerth world my DM and I had. There had been games that have arisen in the past that made me think back to that old game, but this is the first that has made want to try it out again. World of Calidar is set up to be "edition neutral" so really I could use anything with it. So I am going to support this one. I'll look for a good edition to try it with too. I'll admit I am tempted to do this with 2nd Ed AD&D or Adventures Dark & Deep. Hey thanks, Tim. How awesome of you to post this on your blog! 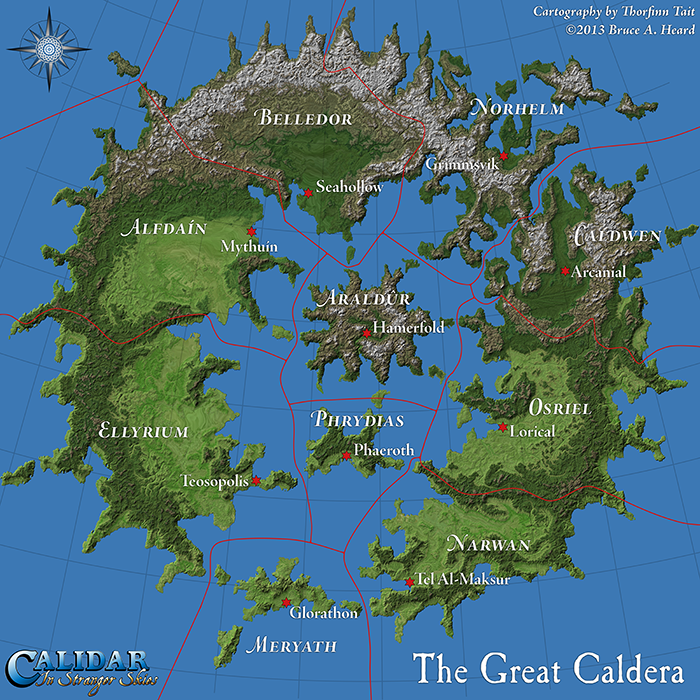 Being system-neutral, Calidar is a bit of gamble, and I hope people won't shy away from it as a result. The choice was made to avoid IP issues with anyone, but also to make it easily adaptable to mainstream RPGs as well as appealing to fiction readers despite Calidar's RPG label. Your faith in my skills and your help in passing the word are very much appreciated! I hope it gets the word out.